With small house living becoming so popular these days it’s great to see all of the new tiny house designs and building companies coming out like this Vermont Cottage from Jamaica Cottage Shop. This tiny house is the most popular one in their collection, and it’s always in stock so it will ship right away. The nice thing about this tiny house design is that you can choose from three different floor plans as well as three different sizes. The first option, Option A features a 4-foot porch while Option B has no porch at all and Option C features a 4 by 16-foot porch on the end. All of the floor plan options include a loft. You can also choose their do-it-yourself plans, or you can get a complete precut kit. With the precut kit all of the materials will be colour coded, numbered and stacked in order to make assembly easy and efficient. The other nice thing about their tiny house kits is that the assembly can be done by beginners with little to no experience and it would only take two people about 40 hours to build. The kits also ship for free within the US and Eastern Canada, but you can save up to $500 if you pick up your cabin from the Vermont factory. The company also offers financing for those who would like to pay for their tiny house over time. That means you can jump right into small house living or vacationing in your cabin. The tiny cottage looks so cute from the outside, with all wood siding, perfect for a home set out in nature. As you can see in the photos, customers can choose their colour of stain or paint as well as the colour of the metal roofing to give their home a unique look that’s all their own. Inside, the cabins are all wood as well, and you can have them insulated for three seasons or four seasons depending on where you live. There are great windows that open up wide to allow fresh air into the cabin and natural light to expand the space. The higher ceiling in the living room area of the tiny house design also gives the illusion of more space too. If you live somewhere that gets colder, a small wood burning stove is available to purchase as well which would keep the tiny house nice and cozy. The tiny house design also has a bathroom that can have a regular flush toilet or a Natures Head composting toilet. Above the living area is the loft which is tall enough to stand up in and can accommodate a bed in it. There’s also a small kitchen area that you could put a full sized stove and oven in as well as a fridge to keep your food fresh. The great thing about this company is that there are plenty of other tiny houses that you can choose from in their collection, and you could even add onto your small cottage if you need more space later on. The Vermont Cottage starts at around $10,000 which is very affordable for a tiny house or a cabin. 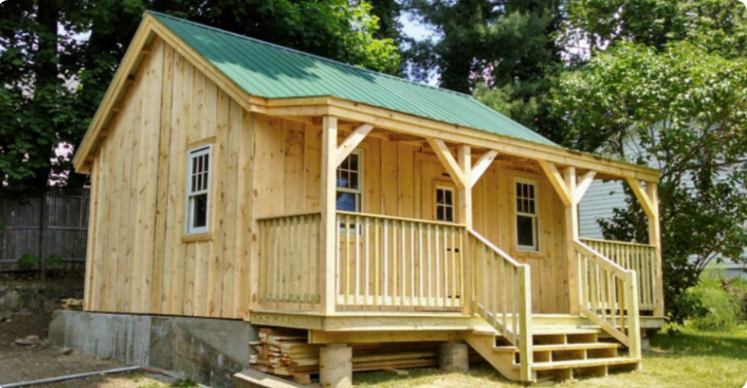 They also have smaller cabins and sheds that are as low as $2,000 that would be perfect to use as a gardening shed or a little studio in the backyard. Some people even create home offices in these little units, and it works as a great way to work from home without having to be inside the home. If you’re interested in a more mobile option for small house living, you can also check out their tiny houses on wheels as well.